The perfect family getaway loaded with amenities. Enjoy fantastic upgrades and ample space for the whole family at Gotham Pointe. 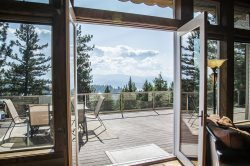 From the awe-inspiring architecture—including heated floors, gorgeous stonework, and top-of-the-line woodwork—to the magnificent views from its perch above Lake Coeur d’Alene, no detail was overlooked in all 6,000+ square feet. Surrounded by windows, the main living area has stunning skyscraper ceilings, leather seating around the stone fireplace, and deck access. With gorgeous granite countertops, seating for 2 at the island, and every top-of-the-line appliance, the fully stocked gourmet kitchen is a dream to prepare meals in. The nearby dining area offers seating for 6 at the elegant wooden table situated in front of a large window with beautiful lake views. A convenient laundry room with a sink is located just off the kitchen, a half bath is conveniently located near the living room, and a cozy office area with wooden built-ins is tucked away near the master bedroom. This huge bedroom is equipped with a king bed, beautiful built-in with a TV, a myriad of windows, deck access, and a magnificent attached master bathroom. You’ll feel like you’re in a luxury spa in this bathroom! The gigantic stone shower has multiple nozzles—including a rain-style shower head—and you can enjoy the fireplace from the shower or soaking tub. There are also double sinks, a private toilet area, and plenty of extra counter space. Downstairs you’ll discover a huge entertaining area—complete with luxurious, comfortable seating that you’ll melt into as you watch a movie on the large TV. Nearby is a full bathroom with a tall glass shower. If you’d like to enjoy fresh mountain air, this level also offers easy access to a great patio area. In the upper level of the home you’ll find five bedrooms and another living room with a game table, leather furniture, and a large TV. The bedroom adjacent to the living room has a queen bed and an attached bathroom with a shower. This bedroom also has a special feature—a kitchenette that includes a mini bar, dishwasher, sink, and microwave. Down the hall you’ll find another bedroom with a queen bed and attached bathroom with a shower, plus double sinks separated by a large counter. Nearby are two more bedrooms with full beds, a bedroom with a twin bunk bed, and another bathroom with double sinks and a tub/shower combo. The outside of this architectural masterpiece is the perfect place to enjoy the natural masterpiece that is the Northwest. With breathtaking mountain and lake views and comfortable seating, the expansive deck is sure to be a frequent gathering location. You’ll love soaking in the hot tub in the evenings and the kids will love playing on the large yard in the front and back of the home. From the incredible views to the grandiose architecture, Gotham Pointe will be a vacation all ages will remember for a lifetime. This is a smoke free home and we ask that any smoking (cigarette or cigar) take place outside the stone fenced property, thank you for your understanding. There is also a personal fire ban from May 1st - September 15th; the outdoor fire pit can not be used due to the hot weather and dry forestation we experience in this area.